Theodore's Royalty and Monarchy Site > Categories > General > The monarchical idea and non-traditional faiths: gimmick or what more? The very idea of monarchy, of kingship, is as old as human civilisation itself. It is a natural part of human society, and thus an integral to all major world religions despite any and all attempts to thoroughly reject them. In this context, it would seem surprising, perhaps even ironic, that "new faiths" (or "cults", however we may wish to quantify that often carelessly used term) have at times embraced the monarchical principle or aspects of it, even if seemingly purely as a gimmick - and one that may reveal their intentions and ambitions. After all, some were deviations from Christianity and other traditional faiths, others were pseudo-fundamendalist movements believing to return them to their true and pure state, some capitalised on Western interest in Eastern spirituality, and others (like the Children of God and Rajneesh's Osho) tried to relgionise the Sexual Revolution. Here we will examine in a few examples how the monarchical principle has been incorporated in one way or another into these religions and draw conclusions from it. Keep in mind that even as a Catholic, any research I do of these religions is in a neutral and scholarly manner - not merely to warn people of the errors or dangers of such groups, but also to examine them from a cultural, psychological and sociological perspective. Given that it is a thoroughly American religion (or rather, cult), Mormonism would seem the least likely to embrace aspects of the monarchical principle. However, this is strictly not true and it is easy to forget that Mormon strongholds like Utah could only become part of the USA because they abandoned some of their beliefs (save for some fundamentalists). It is also ignoring the history of the cult and the schisms that grew out of it, which began with Joseph Smith's death and dispute over succession. The Bingham Young faction became the mainline Church of Jesus Christ of Latter-Day Saints. Others include the Bickertonite, Temple Lot and RLDS/Community. A significant fact is that each of these sectrs or cults explicitly refuse to recognise others and thus are seen as "heretics". The story of James Strang, one of the claimants to succession, is a fascinating one. It involves his attempt to establish a kingdom on Beaver Island in Lake Michigan with himself as king. While claiming to be Smith's only true successor, many of his own beliefs differed substantially from others. Strang was elected as a state legislator in Michigan while simultaneously proclaiming himself King on Beaver Island, which lasted until he was killed in 1856. Strang's sect, known as Strangites, remain today as a tiny remnant. One of their scriptures is the Book of the Law of the Lord, which sets out a never-implemented monarchical organisation of church and society. It appears that such a monarchy would be a pure theocracy with no separation of spiritual and temporal power, or a kind of caesaropapism. The RLDS, on the other hand, established by Joseph Smith III adopted the doctrine of Lineal Succession which made the church presidency hereditary within the Smith family. This was one of many doctrines abandoned by the sect when it became the Community of Christ, although maintained by at least one splinter group. The Unification Church, or the Moonies, is as influential as it is controversial. Though denounced by mainstream Christian churches as heretical, the Moonies amassed considerable wealth and influence in business and politics. Moon's anti-Communism brought him a degree of legitimacy in right-wing anti-Communist circles in Asia and the USA. This also brought him a favourable relationship with the regime of Park Chung-Hee. His business empire also included such things as the Washington Times newspaper. After the Cold War ended, Moon strove to promote Korean unification and "world peace", although in reality this may just have been cover for his own political and business activities. The Moonies seem to love the idea of kingship, or a form of it. 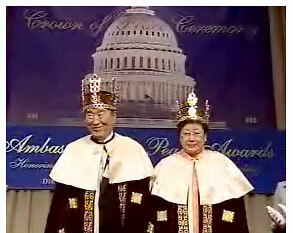 This reached its apex in 2004 when, at Capitol Hill, and with politicians in attendance, a scandalous ceremony was held where Moon and his wife were crowned "King of Peace" and "Queen of Peace". Deeply embarrassing to all parties involved, this incident may just epitomise the sort of ambitions the Unification Church has all over the world - and I'm not sure how Moon's death will affect them. Many new religious movements in South Korea appeared in areas where a new dynasty was prophesised in the 19th century - a belief incorporated into some of them, which indicates a certain continuity with a pre-Christian, "pre-Western" Asian worldview. Even the eccentric entertainer and joke presidential candidate Huh Kyung-Young said as recently as last year that he had "imperial" ambitions to unify Korea, Asia and the world. Transcendental Meditation: Global Governance for Peace? Founded by Maharishi Mahesh Yogi, Transcendental Meditation is one of many movements capitlising on Western interest in Eastern spirituality. Some of these movements have been accused of being cults. Transcendental Meditation, which has considerable interests worldwide, is generally less controversial than many real or alleged cults. Its global ambitions were not merely in business and education. TM, like many other such new faiths, had and has political ambitions as well. In the 1990s, this was represented by the Natural Law Party, which organised in many countries. In the US, the Natural Law Party actually had a modicum of success during the decade to become one of the country's better-organised and more visible "third parties", winning ballot status in several states and fielding John Hagelin in three presidential elections. Hagelin was and remains a central figure in TM. In the 2000 election, he sought to challenge Pat Buchanan for the Reform Party nomination. Critics, however, claimed that it was no more than a front for the political ambitions of TM, being described as "crackpot" and "theocratic". TM subsequently abandoned direct participation in electoral politics and the Natural Law parties by and large no longer exist. In 2000, Maharishi Mahesh Yogi changed course when he founded the Global Country of World Peace as the new political wing of the TM movement. While it may seem like yet another "micronation" (like Hutt River or Sealand), it is rather more ambitious. Even more tellingly, the Lebanese-born Tony Nader (pictured above) was made maharaja in what has been described as observers as a "Vedic theocracy". After Maharishi's death in 2008, Nader succeeded him as head of the movement. John Hagelin leads the American wing, the US Peace Government, and has been titled "Raja of Invincible America", an over-elaborate title for what is merely the director of the movement's American operations based in Fairfield, Iowa. Indeed, the Maharishi University and Maharishi Vedic City are located nearby. Nader, however, lives in the Netherlands. The hierarchical structure sees Nader as maharaja while "rajas" administer territorial divisions. This is evidently part of their vision of establishing world peace under their own version of global government. At the same time, this movement does appear more monarchy-friendly than others. What does the embrace of aspects of monarchical principle by New Religious Movements signify? Is it that they recognise that monarchy is inherent to human nature despite all attempts to get rid of it? That the monarchical principle has certain instinctive appeal to groups who have ambitions of grandiosity? Or is it simply a gimmick, a mask for their global political ambitions? I had to dig this up again because since Sun Myung Moon's death in 2012, his Unification Church has split into three groups- the majority group led by his widow, and two breakaway sects led by his eldest and youngest surviving sons respectively. who is the rightul heir of the throne of Beaver island ?